Greystone Logistics (GLGI) is a highly levered nano cap company that recycles plastic and manufactures plastic pallets. The company grinds up post-industrial and post-consumer plastic, combines that into their proprietary blend, and manufactures pallets. William Kruger was first named CEO in 2003 and he is intimately intertwined with everything. There are many related party transactions involving Kruger and fellow board member Robert Rosene. Rosene and Kruger have loaned money to the company, allowed the company to push back money repayments, personally guaranteed company loans, and used other companies they own to lease land and equipment to back to Greystone. As of the latest 10-K, Kruger owns 30.6% of the common, Rosene owns 16.6%, and another board member Larry LeBarre owns 4.6%. Kruger and Rosene own additional entities to keep Greystone alive and running. Kruger owns Yorktown, which has been used for many things over the years including buying the pallet manufacturing molds, buying manufacturing equipment, buying the raw materials, and running a grinding operation in Oklahoma. It seems that Kruger will use Yorktown for whatever is necessary to keep GLGI moving forward. As of the latest 10-Q, Yorktown leases some manufacturing equipment to Greystone and Greystone pays labor and other costs for Yorktown’s grinding operation in Oklahoma. 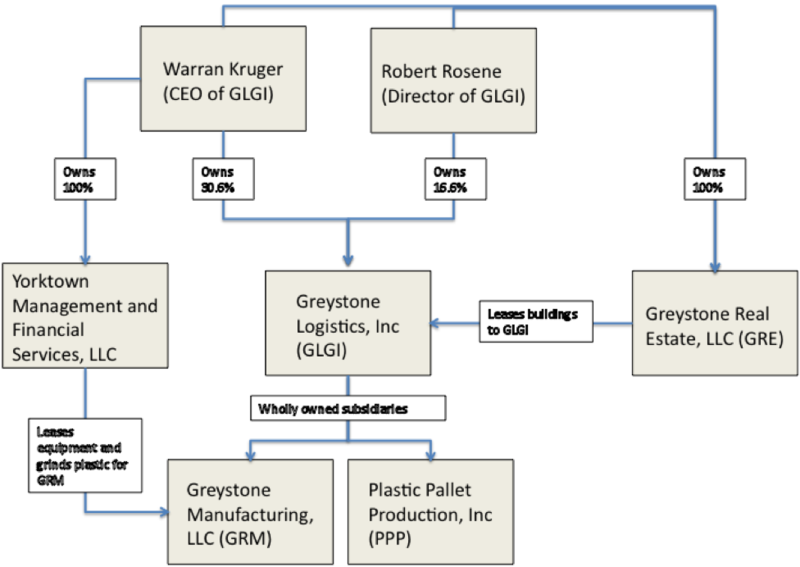 Greystone Real Estate is a consolidated variable interest entity owning the buildings that Greystone uses in Iowa. The GRE owned buildings serve as collateral for GRM’s debt. 1. Pallet sales: Manufacturing and selling pallets accounts for 95% of their TTM revenue. Under this umbrella is the main This is their main business and most of the sales go to one large customer MillerCoors. This reliance on one customer could be perceived to be a negative and they are diversifying their income. 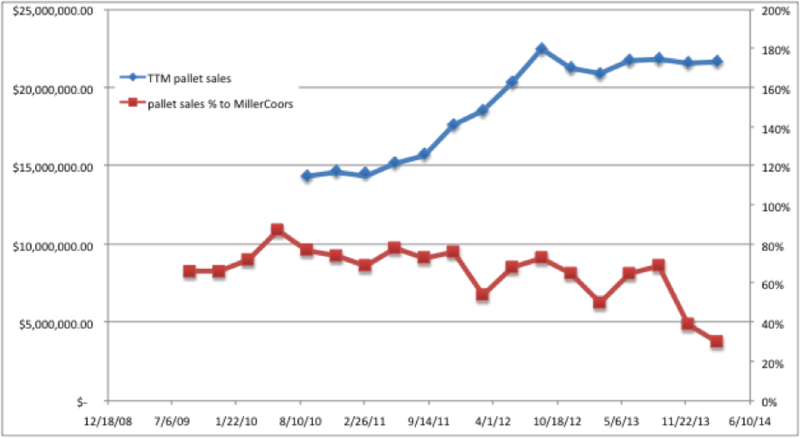 The chart below shows total TTM pallet sales along with the percent of pallet sales to MillerCoors. Overall pallet sales have been flat recently while the reliance on MillerCoors is falling. Greystone first developed and sold a beverage pallet to MillerCoors, next was a half barrel keg pallet, and they are now in the development phase of a slim barrel pallet so the new product sales to MillerCoors have not stopped. Sales to MillerCoors are slowing down as their needs have turned to replacing broken pallets rather than building up inventory. 2. Resin sales: Selling the plastic resin after grinding accounts for 5% of their TTM revenue. 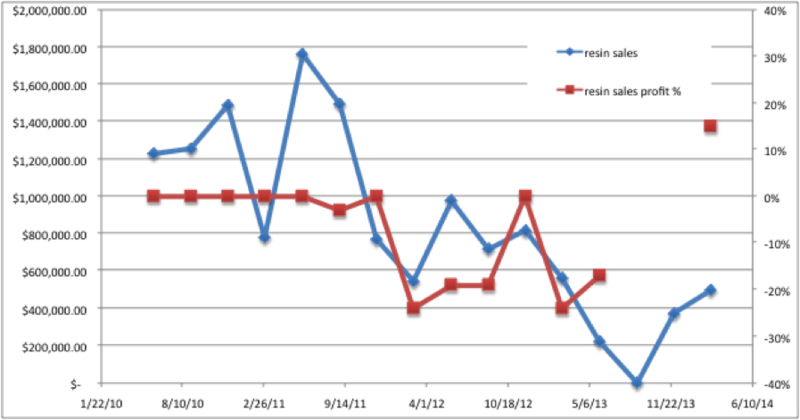 They have been selling resin at a loss since Q4 2010. They ramped up production only to realize the venture was not profitable and since then have been scaling back. The latest quarter is the first time on record that they turned a profit from resin sales. Is this a sign of things to come or an outlier? 3. Pallet rentals: Some companies are reluctant to move forward with the large capital outlay required for pallet purchasing and so Greystone offers a rental agreement. They are engaging customers and have done trial runs but have yet to record a customer. They believe this market will come once they sign that one large customer. These are not just any pallets. Greystone makes specialized pallets for various industries. For example they worked with MillerCoors to develop a half barrel keg pallet and are in the process right now of developing a 1/6 and ¼ slim barrel pallet. The beverage pallet used by MillerCoors is of a size that no one else makes. They will develop specific pallets to match the needs of their customers. The pallets are made to exacting specifications and so are more suiting to an automated environment than wood pallets which may vary in quality and size/shape. Once a customer starts using Greystone pallets they are unlikely to switch. Greystone offers a credit to customers to return used pallets, which they then grind up to make new pallets. MillerCoors has over $30M worth of pallet return credits so if a new pallet manufacturer were to try to take the business they would have to replace that asset up front. The next big customer is likely to be Anheuser-Busch. In Dec 2013, Greystone announced that they have shipped pallets to Anheuser as part of a product evaluation. Since then Greystone has been tight lipped but in Feb 2014 Greystone acquired a new loan and in the loan agreements there were terms for receivables mentioned specific to Anheuser: “An account will be considered in default if any of the following occur: (i) the account is not paid (A) in the case of any account owing by Anheuser Busch Companies, LLC, or any subsidiary thereof, within one-hundred twenty (120) days from its invoice date, or (B) in the case of all other accounts, within sixty (60) days from its invoice date;” See http://www.sec.gov/Archives/edgar/data/1088413/000135448814000508/glgi_101.htm. There is no other company mentioned in the document, why would they specifically call out Anheuser? Greystone has developed beverage and half barrel pallets in use at MillerCoors and is in the middle of developing the slim barrel pallet. MillerCoors has had great success from a cost and sustainability standpoint in their relationship with Greystone and it makes sense for another brewery to leverage the experience Greystone has in the industry, see http://www.millercoors.com/MillerCoors/media/MillerCoors/PDF's/SDR-2011-final.pdf. If Anheuser signs on to replace all of their wooden pallets as MillerCoors did that would likely double Greystone’s revenues. Greystone has been building up a record inventory over the past several quarters. This happened before in 2012 and was followed up by record quarterly earnings. Why would a company that’s been selling pallets for a decade allow their inventory to build up so high? I think they are preparing for a large sale. Perhaps the Anheuser-Busch deal is done or perhaps they have completed development of their slim keg pallet. Maybe the rental business has signed that whale customer. The management tried to take Greystone private in 2013. In Feb 2013 they backed out, possibly because the cost to do so became too great due to odd lot arbs. · Buying some manufacturing equipment and all of the injection molds from Yorktown for $1.3M net payments due between Yorktown and GME. Following this transaction Yorktown is still used as owners of some manufacturing equipment and operators of a grinding facility while Greystone purchased some of the Yorktown equipment and molds. Involvement with Yorktown is declining and the new loan was a step in this direction even though there are still related party transactions and additional companies. The additional loan to Kruger and Rosene for the deferred preferred dividends is no longer mentioned in the 10-Q and so is presumed to have been paid off by the $3.47M preferred payment from the IBC loan. The preferred dividends had been deferred since 2005 as a term of the F&M loan “Parent will not declare or pay any cash or asset dividend on any of its shares.”, see http://www.sec.gov/Archives/edgar/data/1088413/000107261305000645/exh10-1_13341.txt. · Greystone must “maintain a debt service coverage ratio of 1:25 to 1:00 and a funded debt to EBIDA ratio of 3:00 to 1:00.” No statement like this existed in the F&M loan. · Greystone must limit “combined capital expenditures on fixed assets to $1,000,000 per year,”. The 2005 F&M loan limited Greystone to not “more than the aggregate of $500,000.00 in any fiscal year for new capital expenditures,”. · Greystone can make “additional payments to holders of its preferred stock in an amount not to exceed $500,000 in any fiscal year.” Preferred dividends were not allowed by the 2005 F&M loan and as such had been deferred. IBC has shown that they believe Greystone can handle $1.2M (500k preferred, 500k capex, 200k loan interest) higher spending than they had previously while still paying all the bills. IBC must have gone through a thorough review of Greystone’s books and prospects; they came away believing Greystone’s earnings can handle their balance sheet. Either IBC is a more lax lender than F&M or Greystone’s future has earnings to cover their debt. Risks: This is a highly levered nano cap company severely dependent on its CEO and board members with a single customer that has historically accounted for more than have their revenues. The stock trades for less than $1 and is very illiquid. · Debt was required for the high capital costs of developing the business. Greystone is lucky to have a CEO and board willing to put so much personal money in. · The one major customer is not going anywhere and growth from other customers is accelerating. · Greystone has patents and trade secrets surrounding their product. They believe this is their major advantage over other customers. · You buy the current pallet sales and get future growth for free. What happens as environmentalism continues to grab hold? What if the pallet rental business takes off? What if Anheuser-Busch decides to replace all of their wood pallets with Greystone’s recycled plastic pallets? 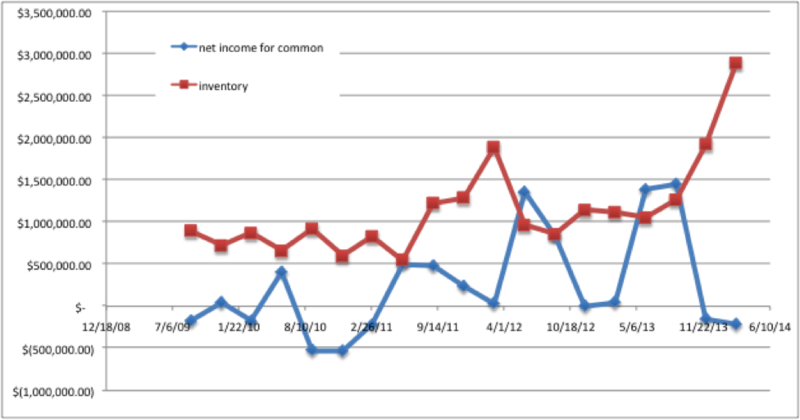 Why has inventory been built up so high? What if market conditions for resin sales have improved to the point of continued profits? What if the CEO merges Greystone with TriEnda? This is a highly levered nano cap company trading for less than $1 on the OTC markets. Please do your own research and use limit orders.